Foreign Ministers of Iran and the 5+1 Powers have adjourned nuclear discussions in Vienna after two days, promising to renew the negotiations on Tuesday — the formal deadline for a comprehensive agreement. [French] Foreign Minister [Laurent] Fabius has to go to New York. [German] Foreign Minister [Frank-Walter] Steinmeier has business in Berlin. I’m sure [British] Foreign Minister Hammond has business outside here, and I had arranged for myself to be here for two days and go back to Tehran to take care of some business at home. US Secretary of State John Kerry also met with Zarif several times over the weekend. The other 5+1 Powers, Russia and China, were represented by Deputy Foreign Ministers. 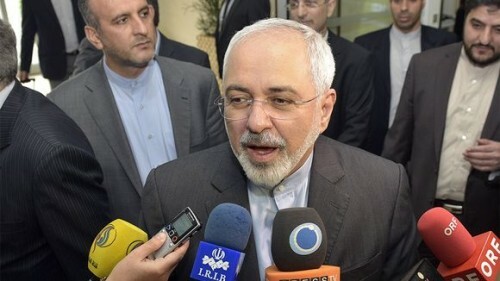 Without giving details of any advances on the final text, Zarif restated his line that a conclusion could be reached “with political will” and if all sides “move forward based on what we have already agreed without excessive demands”. He said a deal needed “serious understanding of the realities”. The Foreign Minister indicated that his Russian counterpart, Sergei Lavrov, would join the negotiations on Tuesday. No conclusion is expected at that point. Iran, France, and Britain all said earlier this month that an extension of a “few days” was envisaged, and the US finally joined that assessment last week. Outstanding issues include arrangements for inspections of nuclear and military sites, with Iran’s Supreme Leader saying the latter are off-limits; the stock of low-enriched uranium that will remain in the Islamic Republic; and the timing of the removal of UN, European Union, and US sanctions. Iranian MP Mehrdad Bazrpash has said that President Obama sent a secret message to Iran’s leaders before the latest nuclear talks in Vienna. Bazrpash said the letter was sent through the head of one of Iran’s neighbors. He did not give further details, but the Iranian daily Hamshahri speculated that the message was delivered by Iraqi Prime Minister Haidar al-Abadi in Tehran on June 17, more than a week after he attended the G7 summit in Germany where he met with US President Obama. In its latest anti-Saudi propaganda, the Revolutionary Guards outlet Fars News has claimed that Riyadh sent drugs infected with HIV and hepatitis to Yemen amid that country’s civil war. According to Fars, “the renowned specialist” said that the World Health Organization confirmed the drugs were infected with “AIDS virus”. In late March, Saudi Arabia intervened in the civil war with airstrikes against the Ansar Allah (Houthi) movement, which consolidated its power in the Yemeni Sana’a the previous month. Thousands of people have died in the violence. Iran backs Ansar Allah, although it says that its own aid is strictly for civilians and not for military use.